The Superheroes Union: Dynama – now available! The wait is over–The Superheroes Union: Dynama releases today! You can order it DRM-free direct from Carina Press or order through major online booksellers like Amazon.com and BarnesandNoble.com. 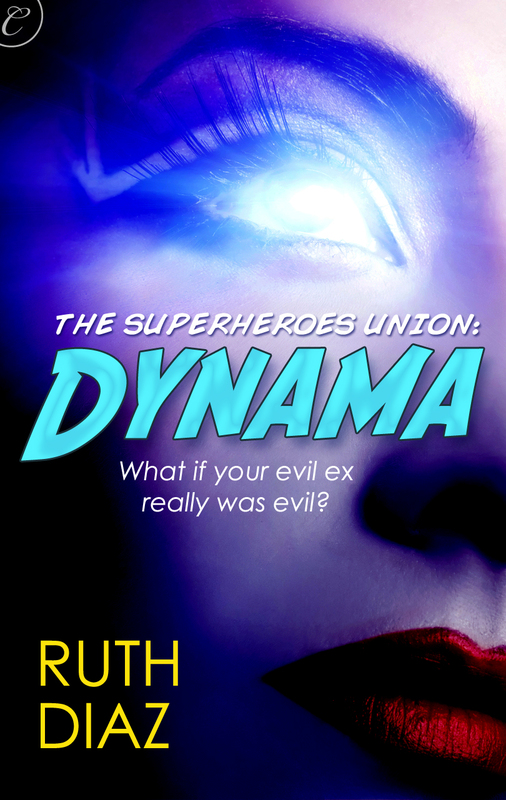 ← The Lesbrary reviews The Superheroes Union: Dynama! Ah, lesbian superheroes! This is so awesome. I recently played a very long GURPS-based rpg wherein I played a female speedster who was reincarnated in various points in history. In one of the iterations, my character was a lesbian–married to an understanding male fellow-super, but with a lover in the community where they lived. Unfortunately, because of the bunch of guys I was playing with, we didn’t get to play out the romance that the GM and I had designed, but oh well. What I do like about Superheroes… difficult to say actually. I think it has, over the years, turned into a “came for the action, stayed for the romance” (or the drama more to the point, looking at how the Gwen Stacy/Peter Parker story turned out, and the demise of Donna Troy over at DC land – even Kitty Pride drew the short straw; but one can still root for Dr. Harleen Quinzel and Pamela Isley). I think it was originally the ideal of absolute moral integrity that drew me in, and man do I sometimes miss the days of black & white heroism. The genre certainly has a long history of killing off women and children to cause an emotional reaction in men. I think part of why I like working with this genre is the opportunity to subvert some of the unwritten “rules” of being a woman in a superheroes ‘verse. I am always a fan of flying superheroes. I did like jumper premise. I always feel like flying is the most outwardly visible sign of superheroes being in some way more than human. ah, flying. the superpower of the subconscious. i had a recurring dream for probably more than 5 years as a youth, that i would be able to fly. the more i dreamed of flying, the more i could control it with my arms. and yet… i’m still afraid to death of heights! even more reasons to live vicariously through superheros. let THEM deal with the power lines! congratulations on the book, you should be very proud. i’m one of those people that has been saying ‘i should write a book’ for 40 years. 😉 if i wrote one, it would be about superheroes as well. a superhero lets us live vicariously the life we are too chicken%&*# to undertake. We can stand up to evil, become invisible, fly away with the princess on our magical pony, without suffering the consequences of abandoning the responsibilities of ‘reality’. since i’ve always wanted to write a book and haven’t, and am living vicariously through you, that makes you a superhero! I love superheros because… well, mostly because they’re people on a larger scale, in all their flaws and virtues. One of the other commentators mentioned that superheroes give people the opportunity to be greater than they are; I think it also gives us the opportunity, but showing us these people who are just like us but larger than life. I also love superheroes because I sort of think the Avengers are the best fucked-up family of the heart that I’ve found in mainstream media in a LONG time, but that’s neither here nor there. ALSO, if I was a superhero I would totally want the power to fly. Or better yet teleport. All the other powers seem like they’d be inconvienent but that one could solve a lot of my problems. Teleporting. I like that. Just the ability to visit whoever and wherever you wanted at any time. Without having to commute or worrying about the airline losing your luggage. While I admit that the appeal of escapism created by a superhero story is high, I have to admit that it’s not intrinsic to the ‘super hero’ genre of story so I can’t focus on that as a reason to enjoy those types of stories per se. Really, I have to suggest that the superhero story’s appeal, to me, is more the ability to step up and be the inner self that you’ve always dreamed is inside you; the self that’s able to step between the gunman and the child, or similar villain/victim dynamic of your choice. To do the things that you know -someone- in the world should be doing, but you know that you’d die if you tried it…but you still want to see it done regardless, because it’s the right thing to do. The essence of a hero, then, I suppose. To have a heart that screams against the suffering of those unable to protect themselves and to have a body that can act on that deep wish. Without getting shot. The feeling of knowing that you can do things that are understandable by the reader on a gut level, so you can identify with the super, and then being placed in the mind and knowing that the person is still a human with weaknesses and holes inside. The holes inside them really make it a story, after all. You have to have potential for change in order to be the star. Something I’ve forgotten occasionally, and those ‘perfect’ super characters always failed to last in terms of playability. Pardon my ramble. Congratulations Ruth for the publishing and let us know when your work proliferates. I have superhero power ADD, sometimes I want to have X-ray vision, telekinesis, super strength, flying, telepathy, the ability to summon swarms of bees…. :)~ Congrats on your book, it sounds like a good and interesting read. Hey, if you’re going to dream, you might as well dream big. *g* Great to hear from you! All man, I know the feeling. I’m not sure I’d want his immortality thing going on, but the healing, oh yeah. Not sure what my superpower would be though sometimes, I think it’d be kinda cool to speak with animals and get their view on things. I’m incredibly excited for this book – my girlfriend loves superheroes and I love f/f romance novels, so this is a win for the both of us! (I’m also glad that Carina Press is adding to their selection of f/f novels. I read a lot of Harlequins anyway, but it’s nice to have some that represent my experience as part of the LGBT community). If I could have a superpower, it would be fluency in all languages. Even dead ones. I think that would be pretty baller. Congrats on your book – am excited about the series! Yeah, I was surprised to see how few they had listed. But there’s mine this week, and there’s even another f/f romance on their schedule for next week. I don’t even remember what it’s about, but it might be worth checking back to glance at it. Dynama looks excellent – i’ll have to try to get my hands on a copy. I love reading about superpowered people partially at least because I like dreaming that there could be something I am gifted at without even knowing it. I think some of my favourite superheroes (in concept if not always in execution) are the X-men because they tend to be born with their powers, and don’t have the whole traumatic accidentoften required to get them otherwise. Although some of the marvelously different powers are quite traumatic as is coming out sometimes (just like another kind of coming out can be), so I guess they’re not much better off. Sorry, that was very rambling… anyway, if i could pick a superpower, though, it would probably be spiderman’s ability to stick to things, because I love climbing trees despite being old enough that some think I should have grown out of it . Thanks for adding a new superhero complete with kids! I’ve always liked the wish-fullfillment aspect of being able to take action, personally and directly, to make the world a better place in a big, immediate, instant-gratification way. The ability to heal (others) is sometimes theoretically attractive, but it’d quickly lead to heartbreak since it’d never be possible to reach *every*one who needs help . . . so, riffing on the President’s comment, I think the ability to speak any and all languages (not just human ones) would be really cool. I’d never thought of it in terms of direct action versus indirect/slower action, but you’re exactly right. Some people dream of being invisible as a superhero. Me, I’d like the power to make certain others invisible (and mute as well)… particularly those who seem to enjoy claiming to know what women are supposed to want or feel or believe or how we should be treated. Telekinesis, definitely. It just would be extremely useful (and seems pretty awesome). I just bought the book and loved it. My choice of superpower would definitely be TJ’s ability to levitate suitcases off the top shelf! Well I’ve always loved the ability to cauterize wounds not to mention the ability to “fly” and read minds. Maybe something primal, like reading body language (97% of what we communicate is without words. ).